Jaques Brel Alive and Living in Paris was a soundtrack to my childhood. Even as a small child the passion of the music left an indelible spiritual imprint. I almost forgot the music, you never hear his songs on the radio. I didn’t know that Seasons in the Sun was based on his Le Moribond (The dying man). The original lyrics differ, the meaning amplified with that unique Jacques Brel wry wit. Belgian born Jaques Brel sang in French, Dutch and English. 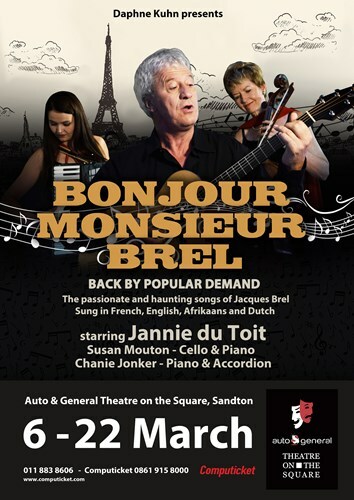 In the stage production Bonjour Monsieur Brel, Jannie du Toit sings and plays guitar. His expressive countenance imparts all which is between the lines, transcending words and language. Susan Mouton on cello plays haunting accompaniment, I would pay even just to listen to her. Chanie Jonker on piano and accordion completed the ensemble, her dancing fingers mesmerise. There is not much speaking in the production but between songs Jannie reads some words of Jacques Brel or shares interpretation and insights into the lyrics. Few words but so much food for thought, seeds in the mind on tenderness, beauty, life and more. Jaques Brel died too young at 49 but he lived in the fullness of creative genius. He may no longer be Alive, well and living in Paris but he is immortal though his music. His work inspired many greats including David Bowie. If you are in Jo’burg I highly recommend that you see the show and emerse yourself in an experience which left me feeling ‘This is what life is about’. I was blessed to share the evening with my friend Karin who plays piano and guitar, and has studied French. We left elevated and enriched. You can book at Computicket or through the Auto & General Theatre on the square. The show is running until 22 March 2018. Would love to attend this! My aunt used to take us to shows of Daniele Pascal, and this looks like the same kind of entertainment.